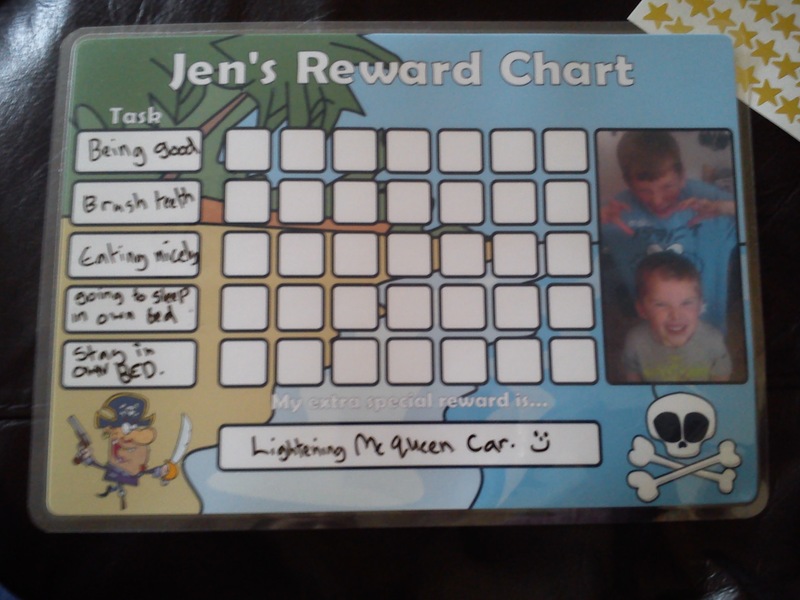 After deciding I was playing strict with the boys recently, I found out about a lovely reward chart site, called Personalised Reward Charts. There were a few different background designs but I went with the Pirate one, and had a photo of both boys put on it. It’s well laminated and came with a dry wipe pen and some star stickers. You can have the days of the week pre printed on it too, but I preferred not to then we can start mid week if we like. The charts are a very reasonable £3, and mine arrived in just a few days. There are lots of designs, football, cartoon dinosaurs, the pirates one we chose and girlie ones such as butterflies and princesses. I wrote down the tasks I’m hoping he does more often, and as the bribery I have offered him a Lightening McQueen model car he really wants. The first day, mainly positive. The second day, well he was a bit of a handful and it’s mainly crosses not ticks or stars. Towards the end of our first week now and I would say he’s been a bit better than last week, but still not perfect. He’s said lovely things like “Mummy if I brush my teeth again now, that means I get a tick on my pirates chart doesn’t it?” so I know that a couple of things have only been as a result of the chart. A few morning when it is wake up time he came through to my room and said he had woken up in the night, but stayed in his room until the alarm clock went off, so he would get a tick for “staying in his own bed”. Quoted from one of the advice pages. 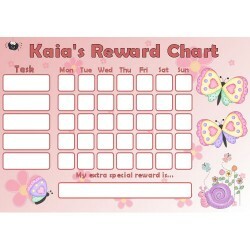 “Did you know that a reward chart can dramatically improve your childs behaviour? 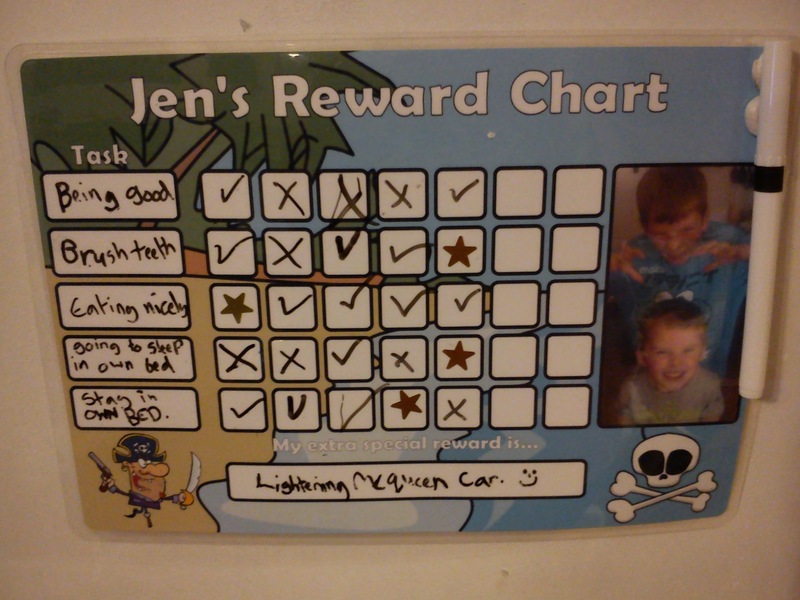 Reward Charts are a tried and tested method, used by parents and leading behavioural experts all over the world. But what does a reward chart actually do? By using a reward chart you are achieving many things. You are setting a goal for your child to aim for, a reason for them to be good. Each time they earn a star, they get a sense of achievement, and encourages them to continue their good behaviour. It allows them to take ownership of their actions. Only they can influence whether they get their reward, and the only way to do it, is through good behaviour. It also discourages from naughty behaviour. By removing a star each time a child is naughty, it helps them to understand the consequences of their actions. They will be further away from their special treat, and need to change their actions if they want to progress. Reward charts have been used by child experts such as Supernanny and featured on many television programmes and behaviour expert books. So how do you use a reward chart? That might sound like a silly question, but there are some subtleties to reward charts that you should know about to ensure you get the best from them. Be clear when you first introduce them. Tell your child exactly what it is, what happens when they are good, what happens when they are bad, and what they will get if they complete the reward chart. For younger children, such as a 3 year old, keep it simple. Good behaviour gets a sticker, bad behaviour removes one. Keep the activities small and achievable for your child, and don’t set the bar too high. For older children, you can be a bit more specific, and reward them for specific tasks such as cleaning their teeth, tidying their room, getting dressed, eating their dinner. For even older children, you can introduce the concept of a routine, and cycle this on a weekly basis. 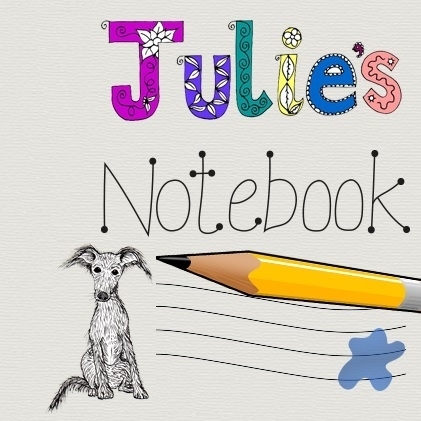 This helps establish chores in their life and responsibilities they need to undertake each day. Be consistent – don’t give stars away for silly reasons, and make it too easy for your child to get their reward, they should genuinely be doing things that help. Likewise, don’t make it to hard for them to achieve, and with younger children, you may need to help them – such as teeth cleaning. Don’t threaten to remove a star and not follow through. Your child knows the rules, give them a warning, and if they persist, remove the star. Constant threats with no action undermine the principle of the reward chart. It may be difficult at the start, but you are trying to prevent bad behaviour, so you need to ensure your child understands about their behaviour and the consequences. What should I reward my child with? On the whole what I like best was the fact its thickly laminated, so not bend and weak, should last a long time. I like that it is wipe clean, we can change the goals each week if we feel we need to. Slight improvements I would recommend, Sticky Velcro pads on the chart itself and on the pen to keep the pen handy, I used white tack as I had no Velcro. Also my son would have loved a car themed chart, racing cars and a cute track would have been ideal. The star stickers are good quality, but I would recommend buying several different small stickers not just stars. I’d love to know where they get them, but my sons teacher has cute stickers that say well done, good work, I’ve behaved and other encouraging slogans. I know in the advice quoted above it says don’t reward with a material object, just with Jen the Lightening McQueen toy is something he’s been asking for for a while, and its approximately five pounds in local shops. Anything to get some sleep! Here are a few of the designs available on the website…. We were sent this chart, pen and star stickers free in return for this sponsored post. No payments were received and all words are mine, except the quoted text. These look great, was just looking for reward charts for the kids! Thanks! Thanks Mummy24 still using it today, Jen is responding better to this than non personal ones like they sell in whsmiths.